5.0 out of 5 starsAn excellent introduction to R! This is an excellent book to get you started with the R programming language, the explanations are clear and the exercises are very well positioned to just test you enough, without being frustrating. I would recommend this as the first book to get if you are new to R.
5.0 out of 5 starsAN EXCELLENT, CLEAR INTRODUCTION TO R CODING. An excellent, clear introduction to R coding. Short, elegant and effective! 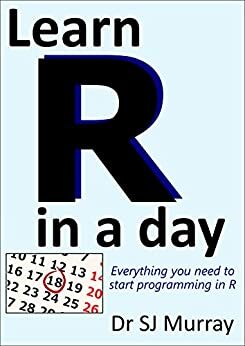 Having not done any computer programming before, I used this book to learn how to use R for analysing my data. As the title suggests it took only a day to work through and it covered all the basics. After using this book I was able to read in and plot my data easily. 5.0 out of 5 starsAn excellent introductory book and good value for money too! This book is excellently written as it is clear and concise with plenty of examples. I found the exercises at the end of each chapter particularly helpful. I recommend this book to anyone who is new to programming or wishes to learn R.
Great reference book for learning the basics of R!